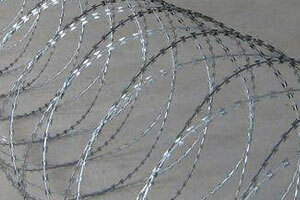 Now, concertina wire can be flat or coiled type and then again it could have single or double coils. 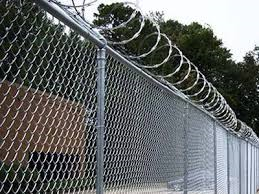 Double concertina wires are made with two pieces of stainless steel razor wire or with zinc coated razor wire; which are bound together for more strength. This is basically a hot dipped galvanized steel plate with strip processed razor wire coils which are extended in spiral type. Clips are generally not needed for this type. Crossed spirals of razor wire are clipped together. Concertina wires are mounted on top of a Y fence post. These are also called electrified safety fences. These are used along with electric power for enhanced security. A copper wire is placed inside the core wire of the razor blade. 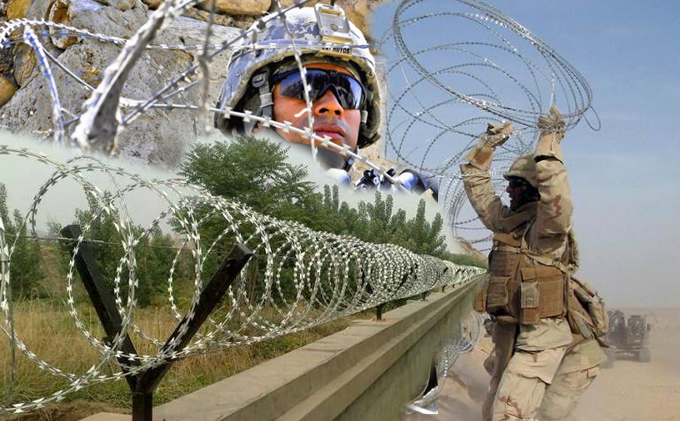 Concertina wire or crossed razor wire are used for military purposes as it can be mobile and installed fast and easy. 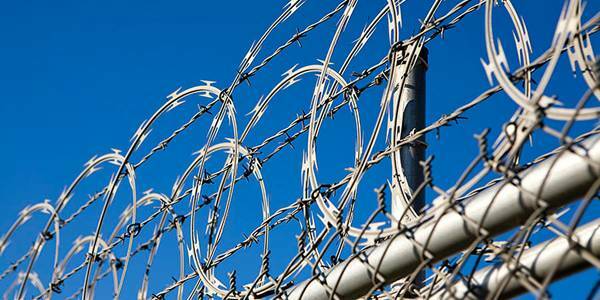 We would like to take you through a step by step guide for the concertina razor wire installation. Now, before you start with the installation there a couple of points that you need to take care of. The material can be installed either on the ground or on the top of an adjoining pole, on the fence or against the fence. 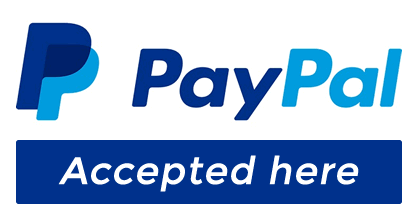 Each type of installation would be unique. Measure the space between one clip and the adjoining one. This determines the spacing between the coils. Usually a spacing of 12” is done with a plus or minus of 2 inches variance. Hence consistency is the key. 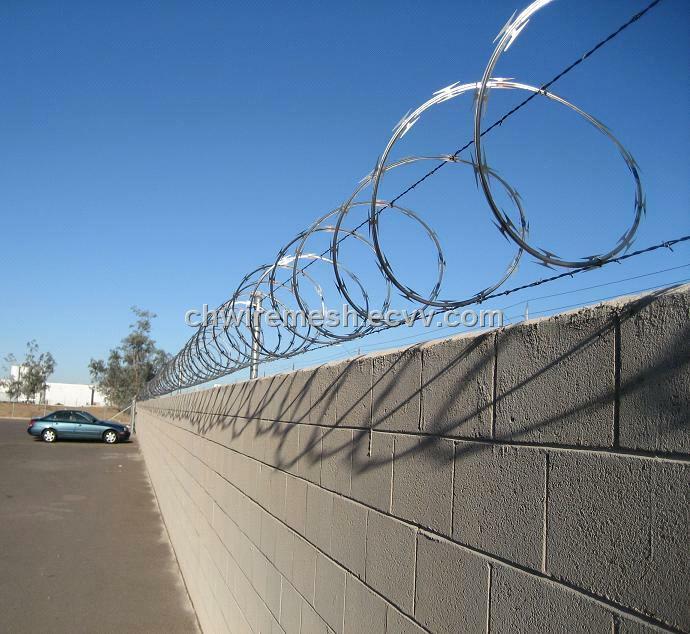 Usually concertina wire is attached every four feet to the adjoining role and on every foot to the fence. 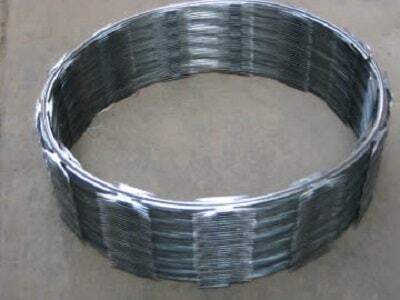 It can be attached with stainless steel rebar ties or with hog rings. Rebar ties generally reduce any vibrations but it does take a little longer to install. Along the fence line arrange the coils. The deployment for each coil needs to be decided. This would depend on the spacing of the coil and the number of coils per roll. But please be careful that you do not place the coils in such a way that you trip or back into them. Place the coil on its side and then remove the wire ties and discard them. Hold the coil steadily and place it along the length of the fencing line. This is where you need to begin stretching. Again take care that you hold the coil firmly, else it might spring loose and injure. Use around six coils and allow them to spring free from the spool which is closest to the starting point. Then these are to be attached to the fence keeping centers of approximately 6 inches. Once the spool has been anchored, take three coils on the other end of the spool. Grasp all three firmly and spread these about one foot from the spool. Grasping all the three spools start stretching the wire. 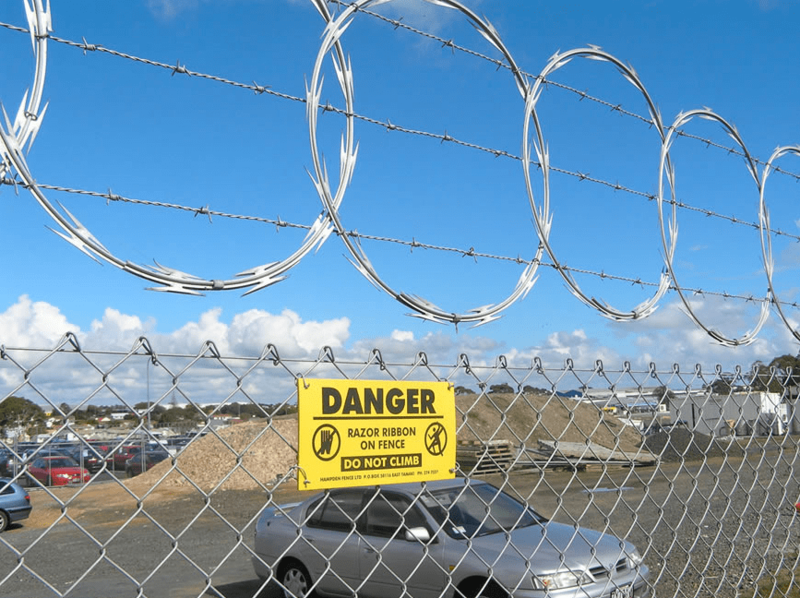 We would recommend that you maintain a distance from the fence as well as the concertina wire to avoid any kind of snags. During the pulling process, shake it gently so as to free any snags between any of the coils. It does happen that barb can get entangled. If it happens, then separate by grasping firmly and spreading them apart. But while you are correcting this, make sure that there is no one else moving the materials. 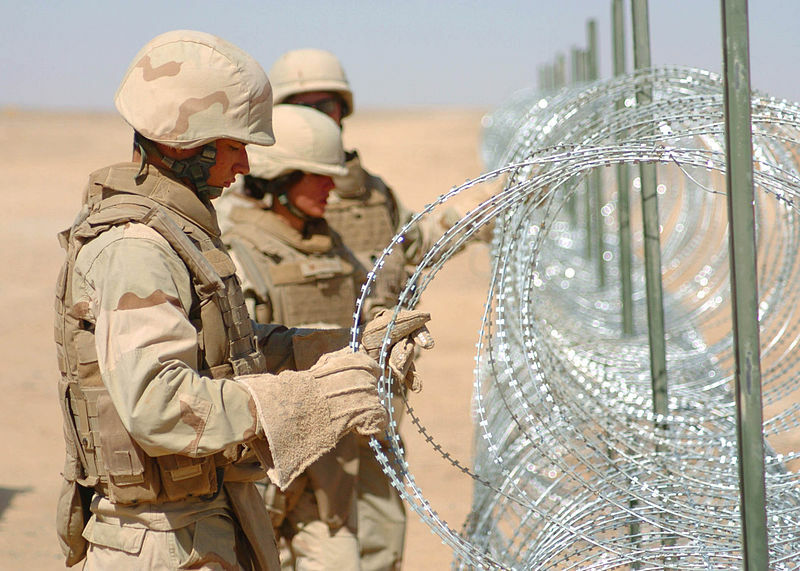 When you are pulling the concertina wire along the fence line, there should be another installer to assure the coil spacing consistency by pulling and lifting the materials. 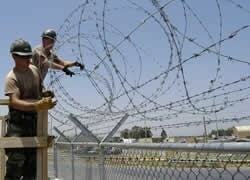 You need to hog ring the ribbon to the chain link fabric, once the concertina wire is in place. It is possible that you might have to twist the coil so that the ribbon is lined up with the chain link weave. Please do not force the coil in to the weave with the hog ring pliers. 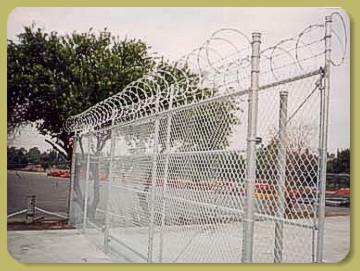 Once all the above steps are completed you will have your well secured razor wire fence.